Living organisms can be divided into Prokaryotes and Eukaryotes. You can click here to see good diagrams showing Prokaryotic & Eukaryotic Cell differences. Go to Wikipedia here to read comprehensively about the common components of Cells, and about the Origin of the first cells on Earth. Plant cells differ to Animal cells by plant cells having a rigid Cell Wall and both plant and animal cells having a few different cell components (called Organelles), suitable for their unique physical functions. For example, Plants have Chloroplasts, which aid them in the process of Photosynthesis. 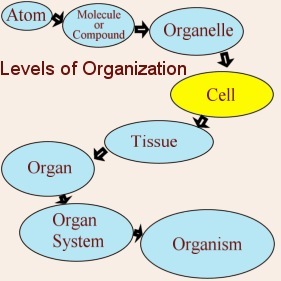 The components of the Cells themselves are made up of atoms arranged into molecules and compounds. Many cells have specialized parts that perform operations no other cell type performs. Groups of one particular type of cell or of a few types make up a tissue. Groups of different tissues make up an organ, that performs a particular function. Groups of organs make up a functional body system. Cells are given names, sometimes according to the tissues that they make up, for example, as shown in the image below. For example, nerve cells make up nerve tissue and muscles make up muscle tissue. Gland cells are epithelial cells and are part of the endocrine system. One broad type of cell makes up a tissue. Two or more different tissues make up an organ, for example, the lungs are composed of muscle tissues, connective tissues and epithehial tissues. The 4 main animal tissues are epithelial tissue, connective tissue, muscular tissue, and nervous tissue. The links below should help you discover more about tissues and organs. Examples of Organs are the skin, heart, liver and kidneys. Did you know the Lungs are made up of Epithelium and muscle tissue? The lung’s tissues are made up mainly of squamous epithelial tissue (called alveolar epithelium in the lungs). This type of tissue serves a critical function within the lungs because it allows the transfer and exchange of gases with little or no resistance. The lungs also contain ciliated epithelium. A function of ciliated epithelium is stimulation of goblet cells to produce a mucous-like substance that not only lubricates but also traps pathogens and particles in the bronchi. The page below shows the tissues making up the lungs, intestine, skin and trachea. An example of an Animal Organ System is the Circulatory system, which consists of the heart, blood and blood vessel tissues. Did you know that blood is considered to be a connective tissue? It is made up of red blood cells and white blood cells. To look at the differences between Plant Cells and Animal Cells, click here. If you are at School, you might have access to a really good board game, called “The Cell Game”. Information about “the Cell Game” can be found here. There are trillions of cells in the animal body and hundreds of different cell types. Cytology is the study of cells. From the Atom to Molecules & Compounds to the Cell to Multi-cellular Structure – to Tissues – to Organs – and then to Body Systems – LIFE or a Living Organism is created. ‘How great thou Art” is true. Let’s respect and understand All Life on Earth, and be grateful for what the natural world provides for us. To read details about Bone tissue (also called Osseous tissue) on this site, please click here. This post here explains what Prokaryotes and Eukaryotes are. Thank you Papaleng, I’m glad u are reading my posts and letting me know that you are finding them helpful or informative.